Los Angeles-the Julien's auction house sold a statue of u.s. President Donald Trump naked, no balls and with a huge belly, for $ $28000 to a tv fan of Paranormal phenomena, said the company. 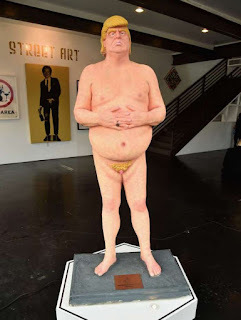 The statue is the work of an anarchist collective on the West coast of the United States that created a series of five copies, titled "the emperor has no balls", and it is believed that the piece up for auction is the only one which has not been confiscated or destroyed. The five creations were placed in public places in Los Angeles, San Francisco, New York, Seattle and Cleveland in August 2016, amid the presidential campaign of Trump. The only statue intact was retrieved by the La Luz de Jesus Gallery in Hollywood, and now your owner, Zak Bagans, will display it in your Haunted Museum in Las Vegas, according to Julien's.